There are times when being a guitar player is amazing. Feeling the strings’ vibration and creating the perfect melody. There are times when playing the bass takes you to a higher place. Hi there, my friend guitarist. You and I have a passion in common. Don’t you feel a hero when playing your best shot? I do. I feel like nothing can take my guitar and I apart. Unfortunately, there are also times when playing becomes a struggle. Standard guitar picks are always so rough and chipping them…oh, it’s such an easy game! I have been there. On the stage, right in the middle of a song. In studio, when recording your last masterpiece. It is such a nightmare when you are giving it your best go but your standard pick won’t just stand it. It was in one of those awful moments that I had this great idea. Why don’t I create guitar picks custom that would best fit my guitar? I am the one who is using picks after all: I can’t think of anyone else but me to design my own picks. It was 2007 and I had just found my own brand EigenPlectrum® in the Netherlands. EigenPlectrum® came to solve the problems that my fellow guitarists and I always had. No more chipping picks, no more rough sounds out of our guitars. After a few years of success in my home country, I decided to share my brand with different nations in Europe and the rest of the world. In 2014, I decided to invest in the production, adding new materials, more quality and more products for sales. EigenPlectrum® has worked side by side with their first customers to make sure they deliver the best quality guitar picks custom on the market. Today, EigenPlectrum® is selling guitar picks custom to the entire world. Design your very own guitar picks custom. Then log into your account: easier done than said! Print your own guitar picks with the best quality there is. How to order your guitar picks custom? Your order is placed and you will receive a confirmation email within a few minutes. You will also be notified when the shipping is ready to leave the Netherlands and you will be provided with a tracking number, to make sure you know when your guitar picks custom arrive. But there is more. EigenPlectrum® offers free shipping for order of € 50 or more. When will I received my guitar picks custom? We then pass the box on to PostNL and provide you with a tracking number. Depending on your location, you will be receiving your custom picks within the shortest time available. Do you have a short deadline? Make sure you contact us and we will be more than happy to agree a delivery date to fit your needs. How many guitar picks custom can I get? You can order as many guitar picks as you need, from one to 1 million. Again, we do not only sell guitar picks custom. Want more out of your guitar picks custom? With our online design tool, you do not need to be a professional designer. You can benefit of our templates, uploading your own pictures or images. Download our templates, customize it with cliparts and texts. Then, pick your product and upload the design you have created: you have just made your very first guitar picks custom. Why choosing guitar picks custom? When I play my guitar, I have that special feeling. It takes me high in the sky, as if the world under me would stop. The flow that comes with my guitar sound makes me feel invincible. All of us guitarists – we share a talent, a passion, an experience. But all of a sudden, here we go again. That bloody standard pick just broke, one more time. That is why, since I started using my guitar picks custom, I have never had the same problem again. EigenPlectrum® guitar picks custom are made with the best materials on the market. They are the result of many year of studies, projects and designs. They are perfectly created to optimize the sound of your guitar and to make your life easy. Plus, they are customized to your needs and taste. Why shall you get guitar picks custom instead of a standard one? Well, first of all, standard picks are made with cheap materials, they do not last much and, because they are average, it will be much easier to lose them. they come with a special package and you will never lose any of them! Looking to promote the next concert of your band? Custom picks are a great and affordable way to advertise the event: they are even cheaper than printed flyers! Want to gift your fellow musicians in the band? Create a set of custom picks, maybe with the band logo and your friends’ names. Your best friend is a guitarist and you are out of gift ideas? Buy them a guitar picks custom card: it will be an unexpected but appreciated surprise! 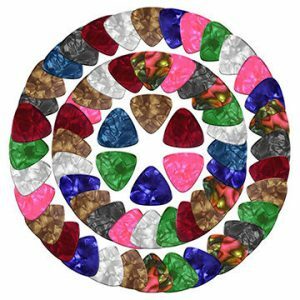 There are a million reasons why you should order your guitar picks custom now: you name them!